The Williams Family was looking for a furry friend to add to their family and happened upon Petfinder. They saw several puppies they were interested in; one was called Pointer. Meanwhile, before they inquired about any of them, their guinea pig needed food, so they headed to a pet supply store, and by chance, Pointer was there at a pet adoption event with the Animal Shelter of Pell City, AL, which had listed her on Petfinder. After playing, Sadie enjoys a good nap, complete with dreams. “She was with another puppy,” Shelby Williams says, “and they were playing and having a good time. 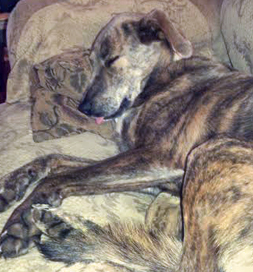 She was beautiful, and we all fell in love with her.” They adopted her and re-named her Sadie. That was a year ago, long enough for them to speculate, in jest, that their cute dog may be part cat. “When she starts to get off the couch, she stretches her way off and sometimes just keeps her back legs resting on it,” Shelby says. Very cat-like. “She also doesn’t mind getting in your space,” Shelby adds. “If she wants to spread out, she’ll lay her head on your lap or stretch her legs on you. Sometimes it’s like she’s trying to push you off!” Also very cat-like – but if she’s part cat, she’s a scaredy cat. Little wind-up toys are her nemesis, and she barks and barks at them. She’s full of energy and can play non-stop then suddenly sack out on the couch for a nap. “And when she sleeps,” Shelby says, ” she sleeps hard. She’s always dreaming.” She’s probably dreaming about how lucky she is to have found a loving family. The Williamses count themselves very lucky, too, to have found Sadie.